It has been a busy last few years for Russell Haswell, with releases popping up in all sorts of places such as iDEAL, No Fun, Warp, Warners and more recently Downwards. 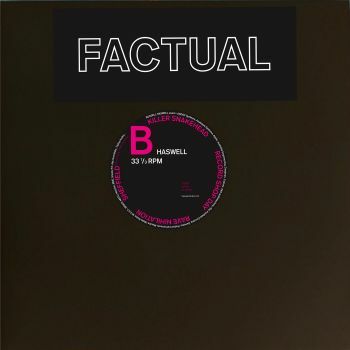 Returning to his spiritual home, FACTUAL is Haswell\'s 5th release for Editions Mego since 2009. Following on from 2011s ACID nO!se Synthesis (a real-time exploration of phase scope image generation: Oscillographics), this new set of tracks takes his use of real-time, one-take, analogue/digital modular synthesis to new levels and extremes. As with most of Haswell\'s work, it is what it says on the box, so BLACK METAL INSTRUMENTAL INTRO DEMO, is exactly that. Or at least should be. A one-man- band flashback, recalling his personal exposure and experiences at early black metal concerts in UK and Europe! URBAN nO!se and RECORD SHOP DAY, are fine sand-blasts of style-smashing experimental noise we have come to expect and love of Haswell, whereas KILLER SNAKEHEAD and RAVE NIHILATION are further investigations into the extremities of Techno and its logical interplay with Japanese Noise. In addition, Complex waveforms, Chaos oscillators and man eating fish, are all dealt with. Finally, to end the album, SHEFFIELD, is a short salvaged live session recorded by Peter Rehberg at Channing Hall (a haven of religious liberalism and tolerance), Sheffield, March 24th 2012.